Get on the open road with this 2009 Holiday Rambler Alumascape Suite 36RLQ. Offering all the comforts of home, this new fifth wheel boasts a spacious layout! This model has wonderful features including a Convection Microwave for quick meals, two LCD Televisions, Home Theater System, and a Fireplace. The Built In Vacuum Cleaner makes clean up a breeze. Other delights include SEPERATE STACKABLE WASHER/DRYER CLOSET, a Free Standing Dinette, Dual Pane Windows, and large slide out rooms for extra living space. Stop by and see this wonderful fifth wheel today! Beautiful rear living room, SOFA/BED), fifth wheel with deluxe cabinetry, smooth fiberglass sides, ducted ac, central heat, awning, stove w/oven, microwave, double door fridge and surround sound system. can be pulled with a heavy duty 1/2 ton truck! Beautiful two bedroom room fifth wheel that has a bath and 1/2, with deluxe cabinetry, smooth fiberglass sides, duct-ed ac, central heat, awning, stove w/oven, microwave, double door fridge! Very clean and with the kids having their own room with toilet that is accessible from the outsider! No Brain'r for a family!! Come and see this quickly it wont last long! "Leave behind your worries with this 2007 Gulf Stream Sedona model S32FBHW. Offering all the comforts of home, this 4 season fifth wheel boasts front queen suite, cozy bunks, mbath and 1/2, ducted ac, central heat and tons of storage throughout. Find new places to explore with this rear living room 2006 KZ Jag. Featuring a front queen, free-standing dinette, central heat and ac, this well kept fifth wheel boasts a full kitchen with huge slides! IMMACULATE! Luxury camping at its best! This 4-season 5th wheel has thermopane windows, central ac & heat, surround sound, seperate living area with desk and fireplace! Searching for a spacious used Gulf Stream fifth wheel? 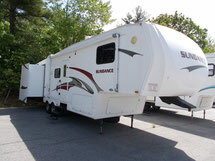 You'll be delighted with this four slide-out fifth wheel available at your Maine RV dealer. Find new places to explore with this 2005 Gulf Stream Mako M-29FRBW. Offering tons of natural light throughout, this well kept RAR LIVING ROOM fifth wheel boasts a spacious layout! This sensational fifth wheel is made by Gulf Stream and is available at Profile State Line Superstore. Nicde smooth sided 5th wheel from Gulfstream has a popular rear living room. The dinette booth and convertible sofa/bed are in the slide-out. Front Power Jacks, Stabilizer Jacks, and Awning are included with this Mako 5th wheel. Citation M-29-5P is a beautiful used fifth wheel for sale at your Maine RV dealership. This 2000 fifth wheel is equipped with roof air condition and a stereo system! You'll love the rich red tone carpeting and lovely cabinetry and mirrors found in this Citation Fifth Wheel. LUXURY, LUXURY, LUXURY! Owned and maintained by one of our premier service techs, this beautiful 5th Wheel has always wintered in sunny Florida. With amenities such as solid surface Counter tops, beautiful Cherrywood, Dishwasher and stacked Washer & Dryer, wonderful Queen Suite with Abundant Storage, and all-in-one bath! It has to be seen to be believed!